I'm still here! Sorry I haven't been posting lately. A lot has been going on and I have not been able to make myself sit down and write. I have been working on a post though that I will publish later. I think it's important to share this part of myself with you. My darling husband had a banner made and placed it in the front yard this morning. We live on a very busy 4-lane street that is used a lot and as most towns, the mornings and quitting time are even busier! Horns have been *honking* all day! I'm scared to go outside for fear that I will be embarrassed beyond belief! Could someone please come get the mail for me? I thought about getting in the car and driving to the mailbox. At least I wouldn't have to walk down the driveway to it! 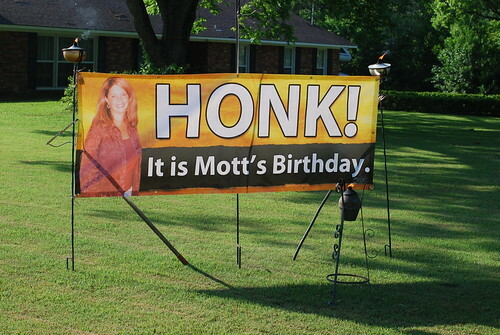 Happy Birthday, Mott! Hope you have a blessed day! Your husband is so clever! !